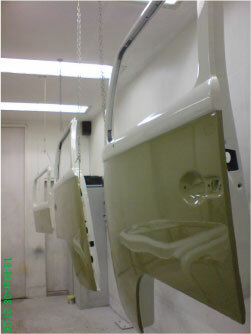 Moores Motorcars has a fully fitted spray booth allowing us to reproduce factory quality finishes. We are equipped to undertake everything from complete colour changing resprays to small localised repairs that can be sympathetically aged and blended into existing paintwork. The detail of our preparation is always to a very high standard and if desired can be to exacting factory standards in every detail. 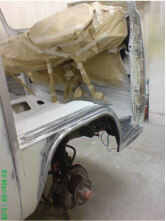 We have in-house shot blasting facilities to remove all traces of corrosion from your vehicle using beads for lighter panel work or grit at high pressure for more extensive corrosion. Blast cabinet facilities are used for refurbishment of wheels, mechanical components and bodywork items. 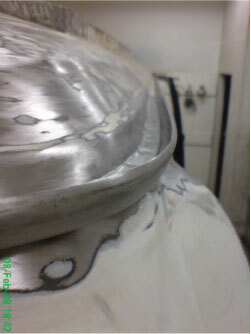 We then use a high quality acid-etching, corrosion-inhibiting coating before applying primers and top coats. One of the most important areas that often gets overlooked is the application of rust inhibiting penetrating wax systems. Any classic car that is going to be used in Britain that does not have various types of waxes applied in the correct way will deteriorate in no time at all. We have the specialist equipment and full range of high quality wax systems to offer a complete protection service what ever the condition of your vehicle. Both our experience and attention to detail in applying the waxes inside cavities, under chassis and inside panels will help reduce further corrosion. 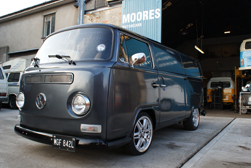 We are recognised by insurance companies as the leading South West specialist Classic Volkswagen repairer. 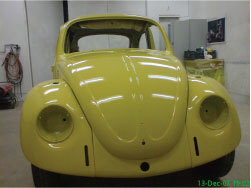 We undertake all VW accident repair work from small dents to large accident repair requiring specialist chassis alignment and complete re-panelling including mechanical repairs. We work with both insurance company engineers or privately to return your vehicle to original condition as quickly as possible. 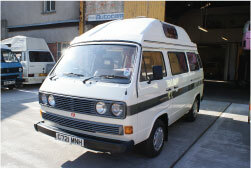 T25 respray with custom graphics. Restoration/Re-spray with custom satin laquer paint.